At the beginning of the summer I installed a countdown application on my cell phone. I set the app to count down the number of days until we begin school again in September. I thought that by regularly seeing the number of days remaining in our vacation each time that I looked at my phone, I would become more vigilant in making the most of each day with my children. It seemed like a great idea at the time. I was convinced that this would be the best summer yet, full of fun activities and adventures. As the summer went on, I found myself becoming stressed over how fast the days were passing. Instead of making the most of each day, I was worrying about how many days were left. Eventually, I got to the point that I avoided looking at my phone altogether because I didn’t want to know what number the countdown app was on. Interestingly, I may have unintentionally stumbled onto a way to reduce screen time. Don’t get me wrong. It’s not that I don’t like homeschooling. I am very thankful and feel blessed to be able to homeschool my children. I would not have it any other way. However, homeschooling is not easy. It is work. There are days when it is wonderful and days when it is terrible, but all days require a consistent effort. Summertime, on the other hand, is a season filled with relaxed schedules and less studying and preparation, at least in our home. By setting the app to count down the days until I would have to really work again, I set myself up to not look forward to school. Yikes! That was not my intention at all. Fortunately, I still have a little time to refocus before school begins. 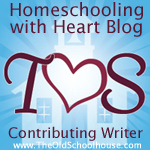 My plan is to spend this time remembering all of the reasons that I homeschool my children. I’m going to actually put it in writing and keep it in my planner. I suspect that it will be beneficial to look at on the hard days. Then, I’m going to spend time in prayer thanking the Lord for allowing me the privilege of teaching my children and asking for His guidance and assurance in this next school year. I will let go of counting days and count on the Lord, as it says in 1 Peter 5:7, “Cast all your anxiety on him because he cares for you.” The Lord does care for me and my children. He has a plan for all of us whether we foolishly try to control it by counting days or not. His plan will not fail. So, may we all begin another school year with hopeful anticipation instead of anxiety. I pray that your school year is truly blessed. Previous Post Do You Need a Preschool Curriculum?